The demographic picture of Canada is changing. And there may be immense long-term consequences for investors. As portfolio managers with a long-term view it is important that we analyze these trends and determine how they will affect Leon Frazer portfolios in the future. 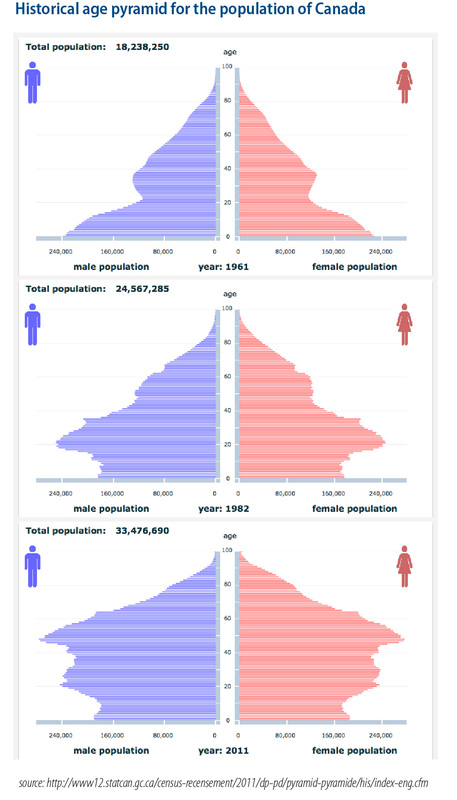 The accompanying chart shows the make-up of the Canadian population in 1961, 1982 and 2011. In shows that 1961 was the peak year for births; 1982 was the peak year for interest rates, and 2011 is where we are today. Look at how the “baby boom bulge” has moved through the population. This is perhaps one of the most significant trends that must be considered in long-term investing. In 1982, baby boomers were finishing university, starting first jobs and developing new households. In a nutshell, the boomers were spending (and borrowing) money. And spend and borrow they did, such that the Canadian economy enjoyed a robust period of growth, with the markets performing equally well. Today, however, reveals a completely different picture. Instead of spending, baby boomers are saving. Instead of buying homes, early boomers are downsizing homes. Instead of buying growth stocks boomers are are looking for growing income and lower volatility. Though we may be in the “third inning” of the dividend investment cycle, as discussed in last month’s Market Perspectives, investor demand for income remains high. This is why we still maintain the Leon Frazer dividend growth style we have adhered to for over 70 years will continue to remain in favour going forward.